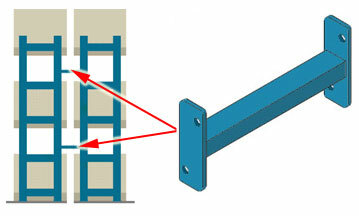 Frame spacers stabilize selective frames when height to the top of the top load is over 6 times the depth of the frame. Also eases installation by predetermining frame separation distances in double row selective setups. Use minimum two to 120" high, three to 216" high, four to 312" high. Do not use as a frame-to-column tie. Order by separation distance. Finish: Precaution Blue. Installation hardware is included.